Host DJ Mistie. Photo by Court Mast. House of Jazz is a weekly jazz show featuring local Bay Area jazz artists for your listening enjoyment. 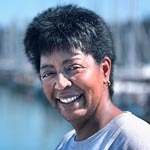 House of Jazz brings the fabulous music of Bay Area talent to Marin listeners. So sit back and enjoy the local talent found right here in our home by the Bay. A Marin native, Kellie Walker, AKA DJ Mistie, has worked on radio shows at Dominican University in San Rafael while completing her B.A. in communications. She has already been the voice of The Scoop, a popular entertainment show broadcast on Dominican’s Penguin Radio. Ms. Walker is completing her Internship in communications at Radio Sausalito. Music has always played a key roll in Kellie’s life. She gets her love of jazz from her father Thomas, who loved listening to jazz whenever the opportunity arose. To e-mail this host, see our Contact the Station page.